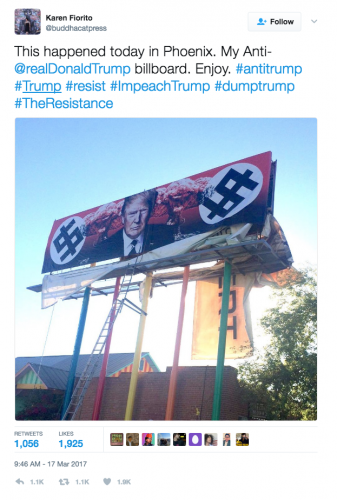 A billboard showing Donald Trump (with a Russian flag pin), nuclear mushroom clouds and dollar signs shaped as swastikas has appeared alongside a freeway in Arizona and now people are sending death threats to the person behind the brazen stunt. Californian artist Karen Fiorito admitted she was behind the campaign and added she’d been inundated with “hate” since the billboard went up five days ago. Fiorito told NBC News the campaign was trying to put “a little bit of humour” into Trump’s “dark” plans to build a Mexican wall, deport immigrants and ban Muslims. “I think a lot of people are feeling this way and I’m just trying to express what I think is on a lot of people’s minds these days,” Fiorito said. And the owner of the billboard is right behind the campaign claiming it will stay as long as Trump is President. “Some of these issues are so important you can’t not speak out,” a spokeswoman said.